이 불화는 기림사 대적광전의 후불탱화로 봉안되어 있는 비로자나삼불회도로서, 중앙에 비로자나불회도 중심으로 왼쪽에 약사불회도, 오른쪽에 아미타불회도가 배치되어 있다. 일반적으로 조선시대에 많이 조성된 삼불회도는 석가모니불화(중앙)·약사불화(좌)·아미타불화(우)로 구성된 삼세불화와 비로자나불화(중앙)·노사나불화(좌)·석가모니불화(우)로 구성된 삼신불화가 일반적이지만 이 불화에서는 비로자나불화와 아미타불화, 약사불화로 이루어져 있어 삼세불화와 삼신불화를 결합한 독특한 형식을 보여주고 있다. 이러한 형식은 중국 남송대부터 나타난 형식이지만, 우리나라에서는 기림사 소조비로자나삼불좌상 등 16세기 불상에서 이미 확인되고 있지만, 불화 중에서 기림사 불화가 가장 이른 시기의 예에 속하기 때문에 자료적 의미가 크다고 하겠다. 이 삼불회도는 전반적으로 한 화면에 많은 존상을 배치하고 있는데, 중앙의 주불을 중심으로 점차 화면의 아래쪽에서 위쪽으로 상승하면서 높은 존격에서 낮은 존격으로 배치하고, 인물의 표현도 점점 작아지게 하여 화면에서 원근감과 입체적인 공간감을 살리고 있다. 색채에서 후대에 일부 개채의 흔적이 보이지만, 황토색의 바탕에 홍색·녹색·노란색·하늘색·초록색 등이 적적하게 조화를 이루어 부처님의 세계를 잘 표현하고 있다. 이 불화는 천오(天悟)·금명(錦明)·최훈(最熏)·적조(寂照)·지순(智淳)·조한(祖閑)·임한(任閑) 등의 화원이 참여하여 1718년(숙종 44)에 그렸는데, 천오와 임한은 18세기 경상도 지역을 대표하는 화승들로 기림사 불화의 진가를 짐작케 한다. 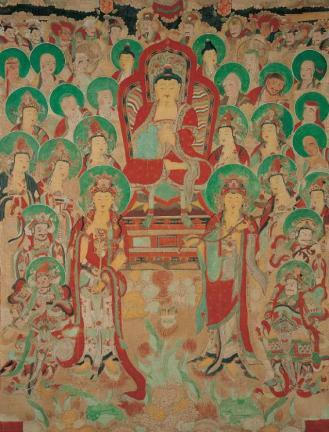 This painting housed in Daejeokgwangjeoni Hall of Girimsa Temple portrays a Vairocana Buddha triad accompanied by an assembly of Bodhisattvas and Divine Guardians of the Dharma. One of the three paintings displayed on the wall of the Daejeokgwangjeon Hall behind the altar, it is flanked by a painting of Bhaisajyaguru Buddha accompanied by a Buddhist pantheon and another one of Amitabha Buddha, also in the company of a Buddhist pantheon, to its left and right. The Buddha triad in Joseon Dynasty paintings representing a sermon scene is most often made up of the Buddhas of Three Ages, and these paintings consist of three panels with Sakyamuni Buddha portrayed in the middle panel and Bhaisajyaguru Buddha and Amitabha Buddha portrayed in the left and right panels, respectively. The triad can otherwise represent the Trikaya (Three Bodies of Buddha), and the painting, in this case, is composed of Vairocana Buddha portrayed in the middle panel, and Rocana Buddha and Sakyamuni Buddha in the left and right panels, respectively. This painting, composed of Vairocana Buddha, Amitabha Buddha and Bhaisajyaguru Buddha, is highly unusual in that it combines the Buddhas of the Trailokya and Trikaya. This type of iconography appeared in China, for the first time during the Southern Song period. In Korea, however, such iconography appeared as early as in the 16th century. The Clay Seated Vairocana Buddha Triad of Girimsa Temple is one of the examples. Among paintings, the triad painting of Girimsa Temple, being the oldest known example, is considered most important. In this painting featuring a large Buddhist pantheon, its many members are positioned according to their hierarchical rank in the pantheon. With the main Buddha in the middle, higher-ranking members of the pantheon are placed in the foreground, and lower-ranking members in the background. Those in the foreground are depicted larger in size than those in the background as well, in a manner to add perspective and spatial depth. The main color tones of this painting having an ochre backdrop are red, green, sky blue and bright green. Although the painting appears to have been retouched in places, in subsequent eras, the choice of colors and their subtle combination are, nevertheless, admirable and perfectly fit the subject matter; namely, the ideal world of Buddha. This Buddhist painting was created in 1718 (the 44th year of King Sukjong’s reign) by a group of painters including Cheono, Geummyeong, Choehun, Jeokjo, Jisun, Johan and Imhan. Cheono and Imhan are two major monk painters of the 18th century, based in the Gyeongsang-do area, and their participation in the creation of this painting is also something that adds value to this painting.